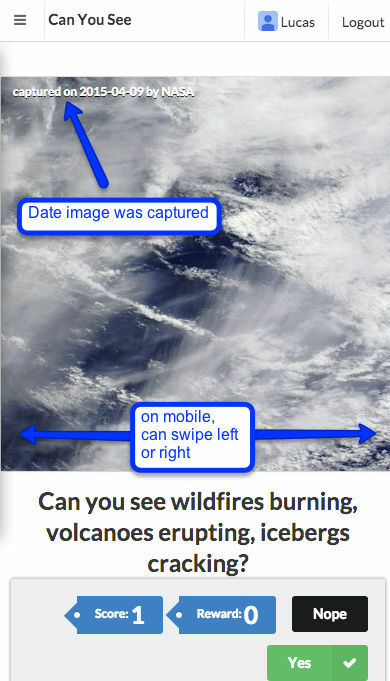 'Can You See' is an mobile/desktop application akin to 'Tinder' but target for assisting NASA in identifying special occurrences on earth by utilising power of crowds. Earth-view images used on the application are from NASA’s satellite imagery API, GIBS. 'Score' points are given to players that are spotting event in each image by swiping left or right. 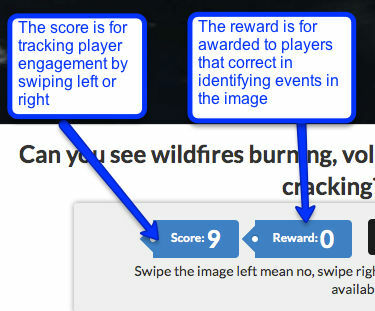 Subsequently, volunteer project observers check only those priority images and decide the signal and mass-reward players with 'Reward' points. This application serves as a tool for volunteers worldwide to utilising power of the crowds to sort images from NASA’s satellite imagery API, GIBS and provide feedback as signal for subsequent investigation. 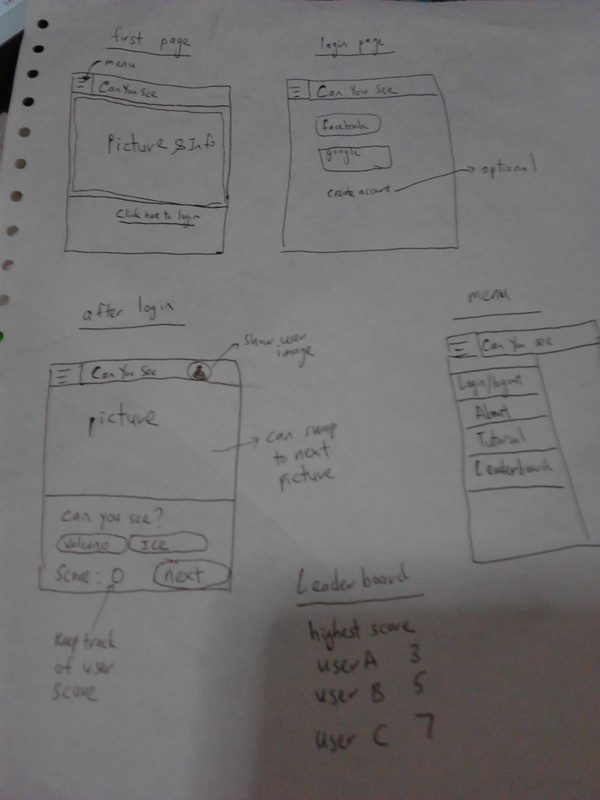 This is achievable through application that run cross-platform on desktop, tablet and latest mobile phones. Application can run directly on latest web browsers. Players also can jump start in the game without required to fill in registration form as they can login in the game using existing Google or Facebook account. For players that concern about privacy, they can use alternative manual way to login with username and password. By utilising power of people's leisure time, this can divert those man-hours into productive activity that useful for everyone. Players can resume the swiping game anytime and it is easily accessible from anywhere that have internet connection. Leader board on the application shows real time players that contribute the most efforts on the game with 'Score' points and 'Reward' points which based of whether the signal is valid. As the target audiences of the game expanded, a volunteer project observers can be set up to process high priority images and mass-reward players. At the moment, data are mainly sourced from NASA’s satellite imagery API, GIBS which can be expanded to social network feeds like Facebook, Google, Twitter, Flickr and Instragram to collect images that marked with special hashtag #canyousee as raw image data into the game. Application currently runs in browsers and able to run on mobile devices. Although it can further improve to support players installing native game on their mobile phones and periodically sourced image data for use during offline. This will allow players to continue to play the game during offline and sync up with the server when online. Currently, anyone that logging into application can play the game at their well and nothing stop them from swiping every images one direction, which speed up their points which happen to application like 'Tinder' as well. A control mechanism can be implemented on application to limit number of images each player can play each day and gradually increase the limit as trust level increased. A new joiner can also be be tested with a set of predefined images which to test whether they intentionally spam the system from time to time during real swiping-session interval. Players that spent most effort in the game and rewarded with the most points can be promoted to become volunteer project observers where they can reward other players with 'reward' points. This will continuously grow the community to become bigger. Encourage more developers that interested to improve this application.